Lineco archival corners are used to securely hold photos and artwork to the backing board under window mats without using any adhesive on the artwork. The corners can also be easily trimmed to a desired size. The corners are easy to attach to artwork or photographs and they also easy to remove if necessary. 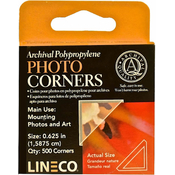 This mounting corner has passed the Photographic Activity Test (PAT) which determines whether or not a storage material will cause fading or staining of photographs. See attaching mounting corners for video and step by step instructions. Uses: This corner size is best used on smaller artwork that has a border of 5/8” or more. 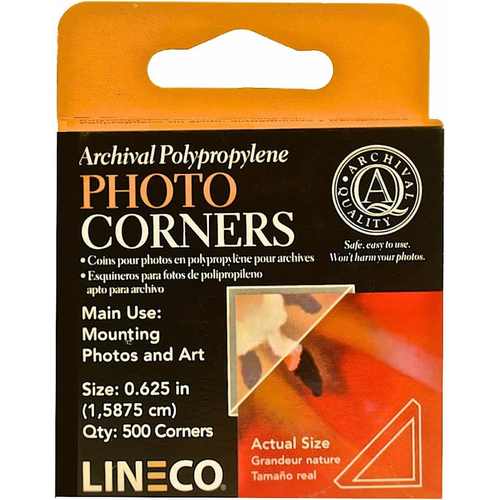 This mounting corner has passed the Photographic Activity Test (PAT) which determines whether or not a storage material will cause fading or staining of photographs.